A new study shows that the Milky Way's supermassive black hole had at least two major outbursts in the last few centuries. 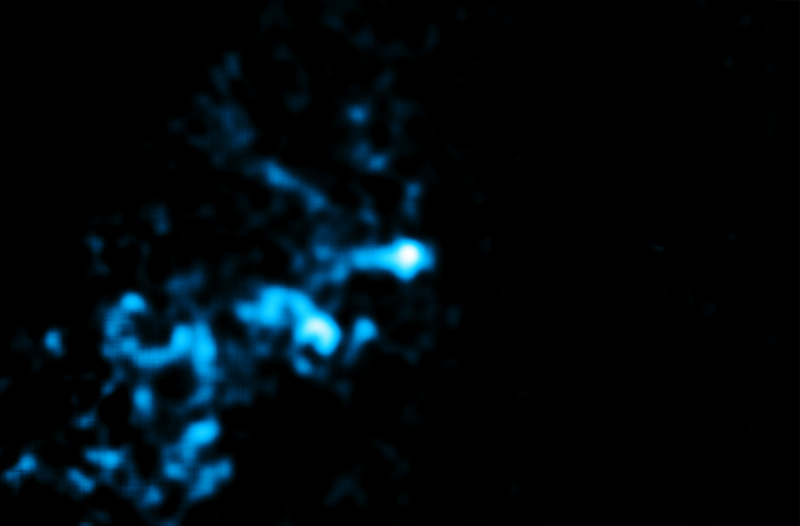 By studying X-ray light that has bounced off gas clouds, scientists can piece together the black hole's past activity. This is a phenomenon called a "light echo" and gives scientists a glimpse into the past. Chandra observations over twelve years were used to make this finding. Researchers using NASA's Chandra X-ray Observatory have found evidence that the normally dim region very close to the supermassive black hole at the center of the Milky Way Galaxy flared up with at least two luminous outbursts in the past few hundred years. The echoes from Sgr A* were likely produced when large clumps of material, possibly from a disrupted star or planet, fell into the black hole. Some of the X-rays produced by these episodes then bounced off gas clouds about thirty to a hundred light years away from the black hole, similar to how the sound from a person's voice can bounce off canyon walls. Just as echoes of sound reverberate long after the original noise was created, so too do light echoes in space replay the original event. While light echoes from Sgr A* have been seen before in X-rays by Chandra and other observatories, this is the first time that evidence for two distinct flares has been seen within a single set of data. More than just a cosmic parlor trick, light echoes provide astronomers an opportunity to piece together what objects like Sgr A* were doing long before there were X-ray telescopes to observe them. The X-ray echoes suggest that the area very close to Sgr A* was at least a million times brighter within the past few hundred years. X-rays from the outbursts (as viewed in Earth's time frame) that followed a straight path would have arrived at Earth at that time. However, the reflected X-rays in the light echoes took a longer path as they bounced off the gas clouds and only reached Chandra in the last few years. A new animation shows Chandra images that have been combined from data taken between 1999 and 2011. This sequence of images, where the position of Sgr A* is marked with a cross, show how the light echoes behave. As the sequence plays, the X-ray emission appears to be moving away from the black hole in some regions. In other regions it gets dimmer or brighter, as the X-rays pass into or away from reflecting material. Note that there is a slightly smaller field of view at the end of the sequence so the apparent disappearance of emission in the top-left hand corner is not real. This is the first time that astronomers have seen both increasing and decreasing X-ray emission in the same structures. 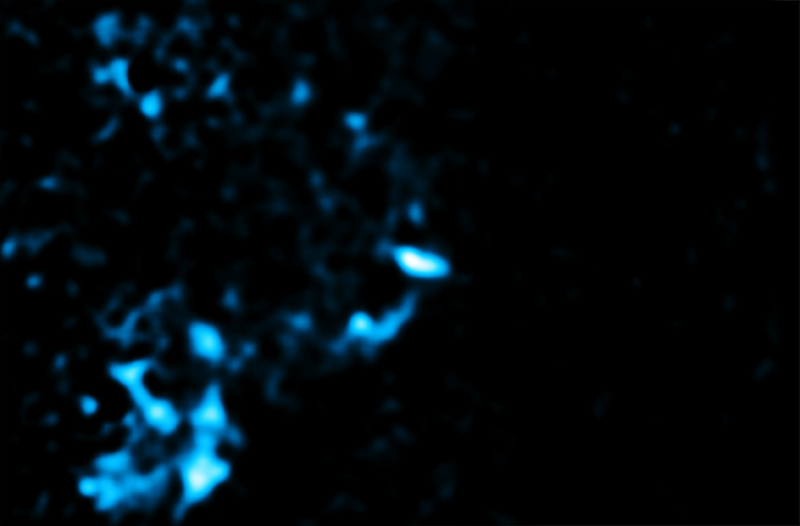 Because the change in X-rays lasts for only two years in one region and over ten years in others, this new study indicates that at least two separate flares were responsible for the light echoes observed from Sgr A*. There are several possible causes of the flares: a short-lived jet produced by the partial disruption of a star by Sgr A*; the ripping apart of a planet by Sgr A*; the collection by Sgr A* of debris from close encounters between two stars; and an increase in the consumption of material by Sgr A* because of clumps in the gas ejected by massive stars orbiting Sgr A*. Further studies of the variations are needed to decide between these options. The researchers also examined the possibility that a magnetar - a neutron star with a very strong magnetic field - recently discovered near Sgr A* might be responsible for these variations. However, this would require an outburst that is much brighter than the brightest magnetar flare ever observed. A paper describing these results has been published in the October 2013 issue of the journal Astronomy and Astrophysics and is available online. The first author is Maïca Clavel from AstroParticule et Cosmologie (APC) in Paris, France. The co-authors are Régis Terrier and Andrea Goldwurm from APC; Mark Morris from University of California, Los Angeles, CA; Gabriele Ponti from Max-Planck Institute for Extraterrestrial Physics, Garching, Germany; Simona Soldi from APC and Guillaume Trap from Palais de la découverte - Universcience, Paris, France. Observation Time 477 hours 21 min (19 days 21 hours 21 min). You probably could get a really good picture of the milky way's black hole compared with all the other black holes in the universe, because the distance from the earth to the center of our galaxy is not very far, and also because x-ray's don't travel very far without losing a large amount of energy anyway. Universe without beginning or end continues changing every moment, eternal flow of energy and matter.Only permanent thing is impermanence. This reading for an amateur like me, is beautifully interesting and informative. About 140 light years across.